Country: Sweden | Beer Apprentice - Craft Beer News, Reviews, Interviews and Info. How’s it going guys? Thanks for checking back in on another craft beer review. This time I’m going to be trying a collaboration beer. It’s the Evil Twin/Omnipollo Russian Roulette produced by both Evil Twin Brewing located in Valby, Denmark and the Omnipollo Brewery located in Stockholm, Sweden. A commercial description can be found from both brewers websites, eviltwin.dk and omnipollo.com. Let’s take a look at them. Congratulations, you have just managed to get your hands on Russian Roulette – a rare kind of collaboration between Evil Twin Brewing (Denmark) and OMNIPOLLO (Sweden). This beer would best be described as an IPA with a twist. A twist that will reveal itself first after you “bust some caps”. One thing remains sure however, if you like hops and the lush texture of a well crafted beer this will have you smiling as you face your destiny. Good luck. 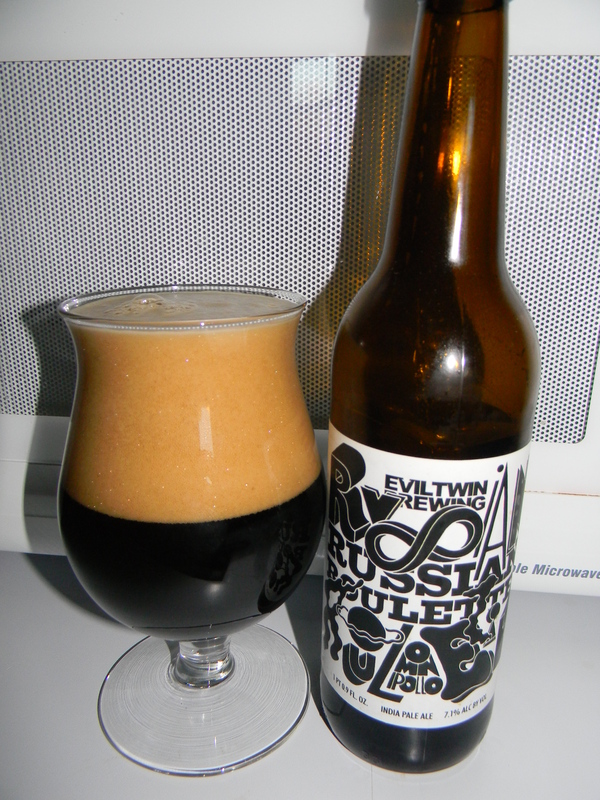 Russian Roulette is a collaborative effort between Omnipollo and Evil Twin Brewing. In short; we met in Copenhagen on a cold day in January, brewed a beer each — an IPA and a black IPA — at Amager Bryghus, and sealed them in identical bottles. Bust a cap and face your destiny. This beer came in a 16.9 oz. bottle and it had an ABV of 7.1%. It poured black with only the most faint glimpse of ruby showing through when held directly toward the light source. The head produced was gargantuan from a fairly aggressive and unprofessional pour by me. It was khaki colored, soft, fluffy, a touch rocky and rather creamy. The retention time was superb and the lacing looked very nice too. 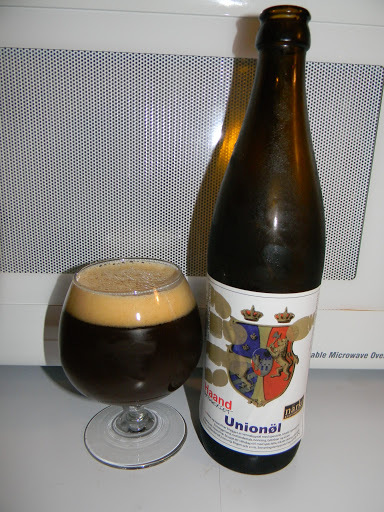 The nose released a fairly prominent waft of pine along with a tone of orange citrus. Hints of mint and earthy hops as well. Some light roastiness and breads too. I even got the most feeble tone of chocolate also. It smelled pretty good I thought plus it was relatively complex. The taste seemed to be more roasted than it was in the bouquet, however the hop profile was still very conspicuous. Again, it was minty and piney with just a smidgen of citrus. The chocolate was noticed again too and I also got a touch of coffee. That may have just been the trace of roastiness I was tasting. Not for sure about that. Either way, it lent itself to a relatively bitter profile. The mouthfeel was medium bodied. Dry and smooth, but with a slight chalkiness from the malts. A touch of warmth was felt and the carbonation was of medium strength. A solid amount of flavor was left on the palate for me to enjoy between sips. Overall, I found this to be a very sturdy beer. Even though Black IPA’s are not really a style that I’ve traditionally gravitated toward… I thought this one was pretty good. It was a very easy drink and definitely worth a try if you can get a hold of a bottle. Especially if Black IPA’s are your thing. The Evil Twin/Omnipollo Russian Roulette should not be overlooked in my opinion. Give it a try and let me know your thoughts.